An impressive group of over thirty outstanding professional artists from the Brandywine Valley area will exhibit and sell original new works of art at the 2015 Delaware Foundation of Visual Arts' annual summer arts show at Greenville Crossing One. The event takes place Friday, May 29 - Saturday, May 30, starting at 10 a.m. both days. The “Outdoor Gallery” will be under the covered walkway of the shopping center. A portion of the proceeds benefit DFVA which provides Art Scholarship and educational programs for Delaware High School students, and is tax deductible. Sponsored by the Merchants at One Greenville Crossing. 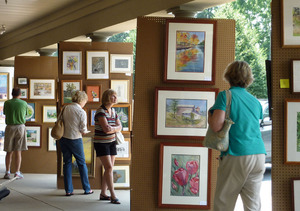 The Delaware Foundation for the Visual Arts has been in existence for over 20 years, but the Greenville Summer Art Show has been around even longer! The Greenville Show began about 50 years ago when Shields Hardware was at the end of the shopping center. Several local artists approached the Sheilds about setting up an art show outside the store. The show began as a small, refined show of hand picked artists. A percentage of the sales were donated to various charitable organizations. When Shields moved to Hockessin, the Greenville Summer Show came to an end. The locals as well as the artists missed the event. John Matassa, one of the founders of the show, later approached Irma Reinhold, founder of the DFVA, about continuing the show. 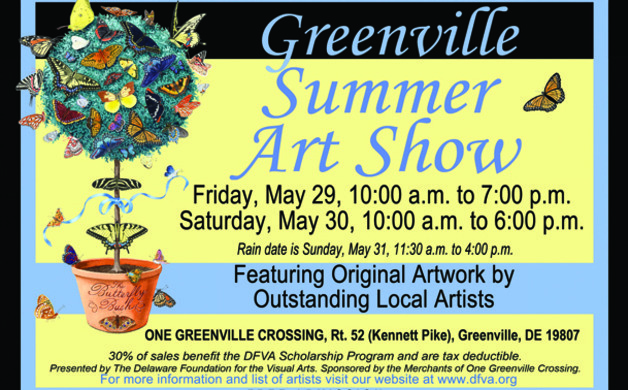 Today the DFVA Greenville Summer Art Show continues the tradition of a first rate outdoor art show on the same grounds of the original show. Members of DFVA who participate in the show have had their artwork juried in order to be able to exhibit. Through sales of artwork, the DFVA funds its mission to develop a wide-ranging network of support and encouragement for the aspiring visual artist and to foster understanding and appreciation of art and its importance in our society.